Ion House Party is the easiest way to create an instant dance party anywhere. 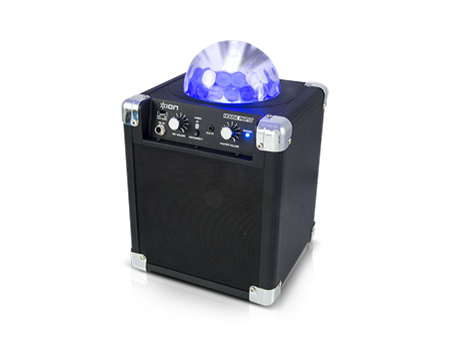 Ion® House Party is the easiest way to create an instant dance party anywhere. This powerful and flexible all-in-one sound system will amplify almost anything – iPad®, iPhone®, iPod®, Android® devices, microphones, and instruments. House Party’s built-in lighting automatically bursts into action, pumping and pulsating in time with your music while changing colors and patterns. These dazzling and colorful light patterns are projected onto ceilings and walls for an instant party atmosphere, while its powerful speaker fills the room with thumping bass and dance-club energy. Plus, House Party’s wireless capability means you can keep your iPad, iPhone, or other Bluetooth® music-playing device right by your side as you blast your music. You can adjust volume, skip tracks, or even mix between tracks using popular DJ apps. Plus, House Party also has an 1/8-inch input to connect non-Bluetooth music players, and a microphone/instrument input so you can connect guitars, keyboards, or a microphone and really get the party started. House Party's lights can be set to Beat Mode or Party Mode. In Beat Mode, the lights swirl and pulsate in time with your music. In Party Mode, the lights take on a life of their own. The lights can also be turned off, so you can use House Party for music only. Dimensions (H x W x D): 12" x 8" x 7.5"